Manchester City has failed in a bid to sign another key transfer target. 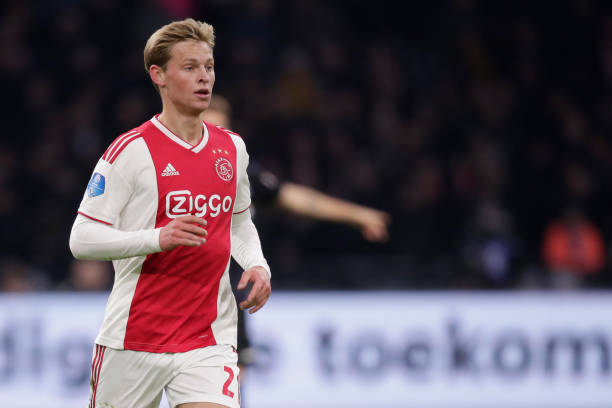 Frenkie De Jong has completed his move to Barcelona thereby leaving Paris Saint-Germain and Man City disappointed. The 21-year-old has been the subject of transfer speculations for several months now with the three clubs battling for his signature. But the Spanish giants secured the midfielder from Ajax in a £65 million deal on Wednesday. He has signed a five-year contract that will see him move to the Camp Nou at the end of the season. De Jong was a key target for City as a viable candidate to provide backup for and subsequently replace Fernandinho. But with Paris Saint-Germain also keen on the the player, the battle line was drawn to secure his services. Although the Netherlands international has revealed he spoke to both Paris Saint-Germain and Manchester City in the process, he decided to join the Catalan side. “I am happy, proud and also somewhat relieved that it’s now all behind us. ”I spoke to PSG, yes. I rang Maxwell to tell him I was not joining them and my agent informed PSG. I also spoke with Guardiola about a move to Man City. Clubs all try to convince you when they want you. I am happy and proud that they did so much to get me." “Barcelona have always been a dream club for me,” De Jong continued. “The fact that they were so serious about getting me and that I have a good chance of getting playing time made the decision a bit easier.